Freeplay well-being walk-shops offer a basic introduction to Creative CBT (Cognitive Behavioural Therapy) and its benefits for coping with situations where normal, everyday anxiety and stress become overwhelming and unhelpful. Participants gain a general understanding of CBT, and of the impact anxiety and stress can have on themselves and others, when situations become difficult. They use activities such as art, creative writing, music, relaxation and short walks with a “mindfulness” approach. Walkshops provide an opportunity to take time out to care for oneself, whilst discovering practical and helpful ways to maintain a sense of well-being in the here-and-now. To attend, participants do not have to be currently caring for someone on a regular basis; they may have been a carer at one time (or about to become a carer) and now be looking for creative ways to care for themselves. NB These walk shops offer an informal introductory, educational, preventative, self-help approach to well-being, and are not an alternative service to the treatment, medical advice and support offered by GP’s and other Steps to Well-Being Services. 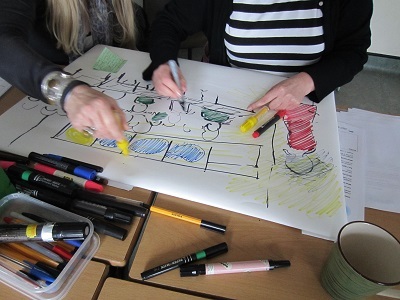 Freeplay will work with your business or organisation to provide bespoke creative training days and 1-1 guided self-help support.